Collection presentation featuring art from the former Soviet Republics and satellite states acquired by the Stedelijk after the Cold War. Freedom is Recognized Necessity will be on view at the Stedelijk Museum from 3 March – 12 August 2018. 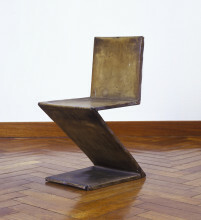 The exhibition sheds light on a remarkable chapter in the Stedelijk’s collection history. Featured are artworks from the Soviet sphere of influence, acquired by the Stedelijk after the end of the Cold War. 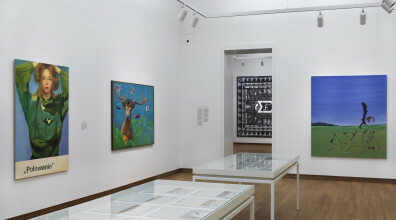 In the 1990s, the Stedelijk hosted several exhibitions highlighting contemporary art from the (former) ‘Eastern Bloc’ countries, which led to the purchase and donation of numerous artworks. Reflections on the political situation and references to early 20th century art are important themes, together with the suggestive use of symbols, and strategies related to performance. 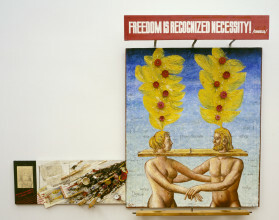 The title of the exhibition is borrowed from a painting by the Russian painter Leonid Lamm (1928-2017): Adam and Eve: Freedom is Recognized Necessity (1974-1984), in which Lamm underlines the complex relationships between freedom and necessity while simultaneously delivering an ironic commentary on the socialist dictatorship. The avant-garde in Eastern and Western Europe maintained an intense exchange before World War Two. However, during the Communist dictatorship – when Eastern Europe disappeared behind the Iron Curtain – and the Cold War, such encounters were impossible for decades. In the mid-’80s, when Mikhail Gorbachev was head of the Soviet Union, with his reform politics of perestroika (restructuring) and glasnost (openness) information about the art of this era started to emerge. 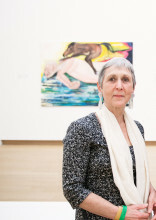 Whereupon, the Stedelijk organized a number of exhibitions in the ’90s, including In the USSR and Beyond (1990), Wanderlieder (1991) and Kabinet (1997), occasioning the purchase or donation of works to the collection. 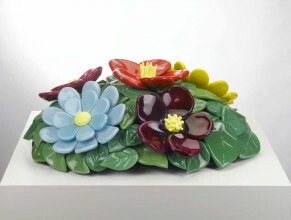 The works in Freedom is Recognized Necessity were produced between 1975 and 2010, by artists from widely varied backgrounds. Some spent their entire lives in the country of their birth, while others emigrated. 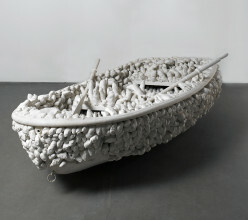 One of the exhibition themes engages with artists’ perceptions of the socialist dictatorship. In the series Case History (1991-1998), Boris Mikhailov (Charkov, 1938) documents the realities ensuing from the dissolution of the USSR. Staged photos chronicle the aftermath of the dictatorship, still painfully evident in the economic conditions and everyday realities of the homeless. 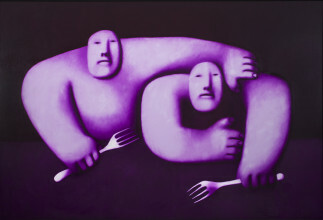 The enormous painting Two with Forks (1990) by Oleg Tselkov (Moscow, 1934) depicts a pair of gigantic, monstrous, expressionless figures. 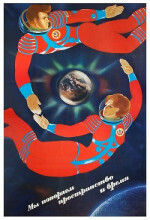 With their mask-like faces, the two men serve as a metaphor for the loss of identity and individuality in Soviet society. 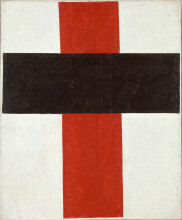 The explicit use of symbols is another theme that frequently appears in the work of these artists. In the painting Untitled (Asia) where letters disguised as tent-poles are topped by feathery plumes, Wilhelm Sasnal (Tarnov, 1972), subtly refers to the indigenous nomadic peoples of the Urals and the shamanic tradition that originated there. 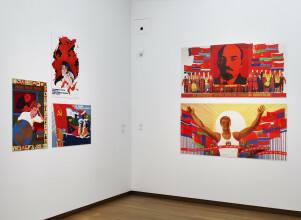 Other artists draw upon symbols typical of Soviet propaganda. 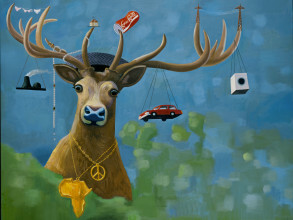 In Trophäensammler (1990) by Milan Kunc (Prague, 1944) we see two different kinds of trophies: a deer’s head, a literal trophy of the hunt, and trophies of the Soviet regime – factories, a car, a washing machine, and the world-famous hammer and sickle. 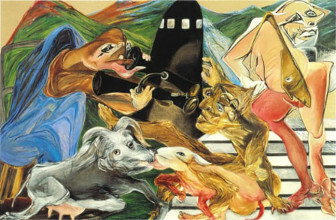 The painting Polowanie (The Hunt), (2010) by Paulina Olowska (Gdansk, 1976) is based on old advertisements for Polish knitting patterns. Often, the style of these patterns was inspired by Western fashions, which were unavailable in Poland at that time. 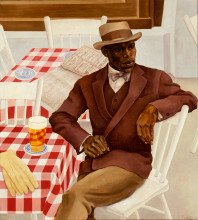 With this reference, Olowska appropriates a popular socialist era image to convey both a political and social meaning. The use of performance as medium is another central theme in Freedom is Recognized Necessity. Performance, or performance-based work, is evident in the work of artists such as Ion Grigorescu (Bucharest, 1945), who gave his performances in the privacy of his own apartment, and Zofia Kulik (Wroclaw, 1947) who incorporated registrations of performance in her monumental photo-carpet, Ulubiona Rownowaga. 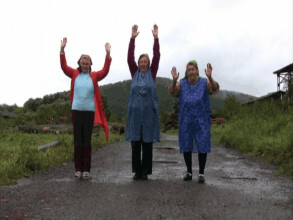 On 9 March, the Stedelijk Museum is organizing Gallery Talk with exhibition-maker, photography curator, and curator of Freedom is Recognized Necessity, Hripsimé Visser. In the form of a guided tour, Visser will talk about the exhibition that illuminates a fascinating chapter of the Stedelijk Museum’s collection history. Tickets can be booked through our website, click here. The exhibition is part of a new, long-term research program, STEDELIJK TURNS, an experimental way of approaching, interpreting and presenting the museum collection.